A few years ago, I accidentally stumbled across a family headstone while looking for interesting graves to write about. The stumble became a story in larger project, and in my returns to the cemetery to visit the grave in question, which marks the burial site of a great-grandfather and his two wives, I eventually got around to walking behind it. These are five of I’m not sure how many children that were born to my great-grandfather and his first wife – they are my half-granduncles and grandaunts. 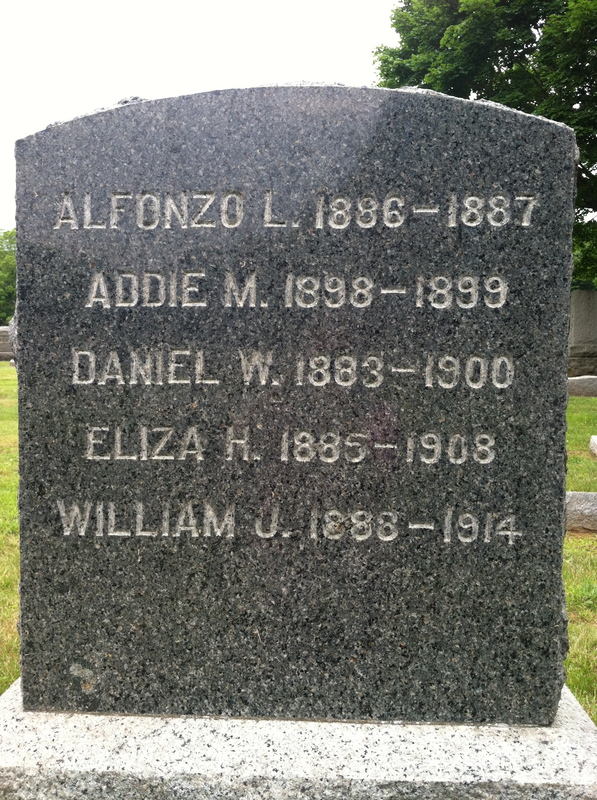 Four of the five died before their mother did (in 1910). I can’t imagine what it must have been like to lose so many children, so young: babies not yet walking, little boys just learning how to help out around the farm, and young men and women, full of promise and ready to start their own lives. I’ve seen these names on various old census records, but census records have the habit of just dropping people off. You know what happened, but not HOW. I’m also not sure if they are actually buried in the family plot – this headstone came along probably after their mother died, if not my great-grandfather, so it might just be a memorial marker for them, listing them alphabetically when they didn’t die in such an orderly way in real life. Checking church records is for another day…and I kind of like the mystery.